December 22, 2014, Rybinsk. - The items related to the development of industrial collaboration between the engine manufacturers in UEC’s Commercial Engines Division, the development of outsourcing at each company and achievement of excellence in this field were reviewed during a dedicated meeting held in Moscow. December 19, 2014, Rybinsk. - In 2014 the Russian Ministry of Energy initiated conducting of an All-Russian competition of the projects implemented in the field of power saving and increasing of power efficiency. 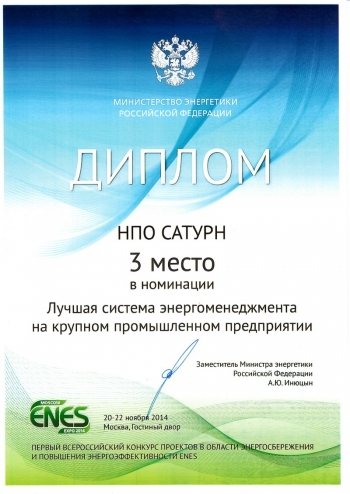 The All-Russian contest was administered for the first time and was dedicated to the ENES 2014 international energy efficiency and energy saving forum. The project presented by NPO Saturn (a UEC company of the Rostec State Corporation) won the third place in the category “The best energy saving and energy efficiency project at a large-scale industrial company” in the sub-category “Effective energy management system”. The festive awards ceremony was organized in the frame of the Yaroslavl energy forum. The awards ceremony was attended by the governor of the Yaroslavl Region S. Yastrebov, deputy governor N. Shaposhnikov, chairman of the Duma energy committee I. Grachev and the president of the National energy saving union L. Roketskiy.